If you are reading this post, you are somehow impacted by social media. Maybe you prefer Facebook to Instagram, or perhaps you idle your time pinning ideas on Pinterest. Whether you have a smart phone, an iPad, or even a Nook, you are connected to those around you. I am so thankful to be living in this digital age, where free-flowing communication keeps me updated, informed, and in-the-know about those things that might otherwise slip my attention. Now, I know there are many people out there who may prefer the more traditional forms of communication: phone calls, letters, face-to-face visits… and that’s great for them! I enjoy, however, the fast-paced, never-ceasing overload of photos, words, and resources that magically appear on my phone at the touch of a button. Today marked a milestone for me on Twitter. After only four and a half months of engaged interactions, I received a notification that I now had 1,000 people following me – how exciting! Now to answer the question you may (or may not) be wondering: Do I actually know all 1,000 people in that list? The simple answer is: No! That’s the beauty of social media, my friends. You don’t necessarily have to “know” people to learn from them. I use Twitter to engage my mind. Learn more. Do more. Be inspired. Think deeper. And today, I have 1,000 people to thank for making me a better leader, a better mom, a better person. On Twitter, we call those “people” whom we follow closely our “PLN” (Personal Learning Network). These are the people who post links and tweets we then retweet or mark favorite. Sometimes we learn about them personally; sometimes it’s strictly business. There are Twitter chats; hundreds, in fact, where we can gather at the same time, half a world apart, and converse. Share ideas. Ask questions. Brainstorm. Grow. It’s hard to believe it’s only been 4 months since I presented an Ignite session at the ISTE 2014 conference in Atlanta. My interactive world has exploded with connections left and right. I am in a constant state of life-long learning, a path which grows longer each day, but is marked by sunshine and joy. Nowhere else can I receive free professional development, in 2 minutes or less, while waiting in line at the grocery store. 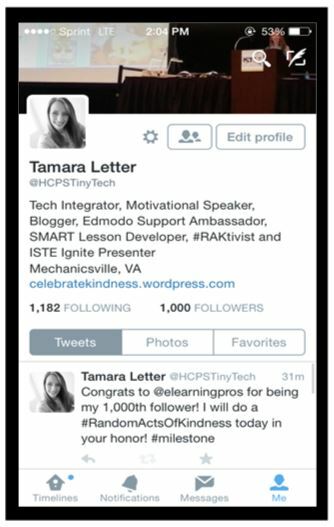 So today, in honor of @elearningpros becoming my 1,000th Twitter follower, I performed a random act of kindness to celebrate! 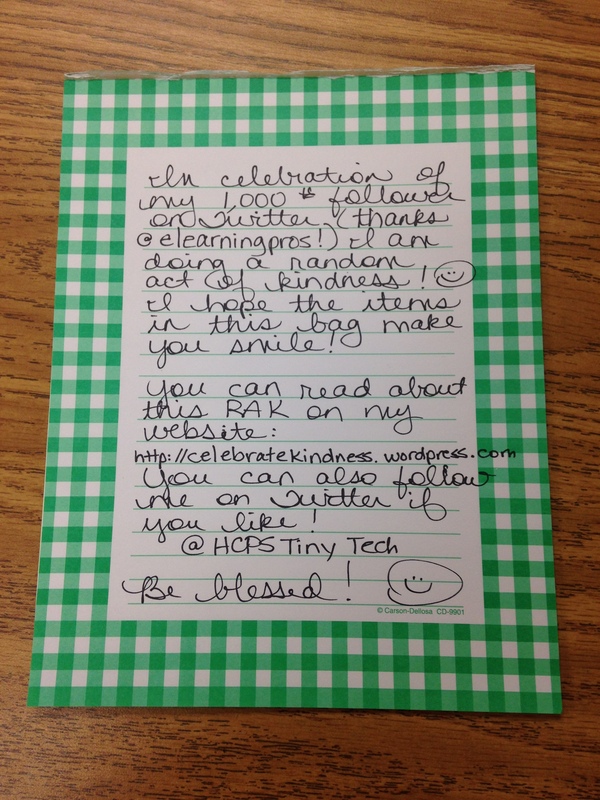 I wanted to do something techie – after all, this was a social media celebration, so I picked up a few things at the store on my way to Starbucks. 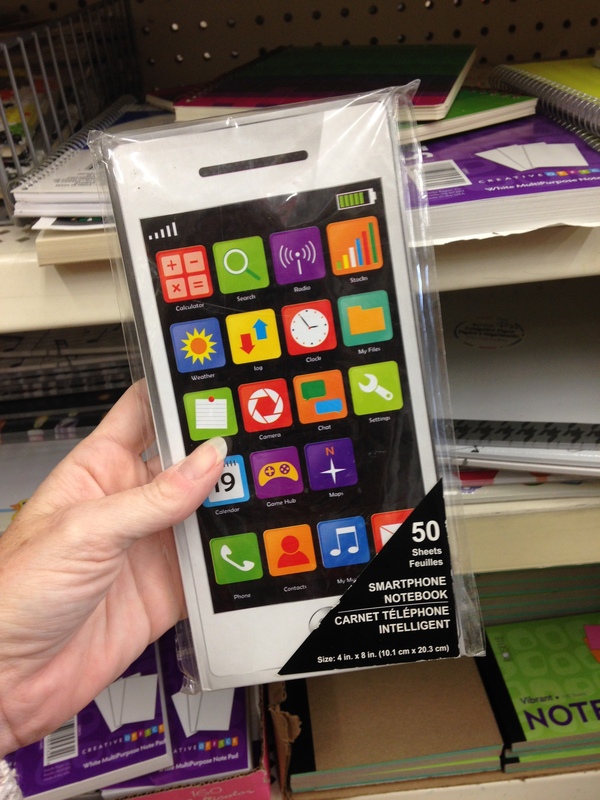 I found an awesome Smartphone notebook that had app icons on the front (how cool is THAT?) 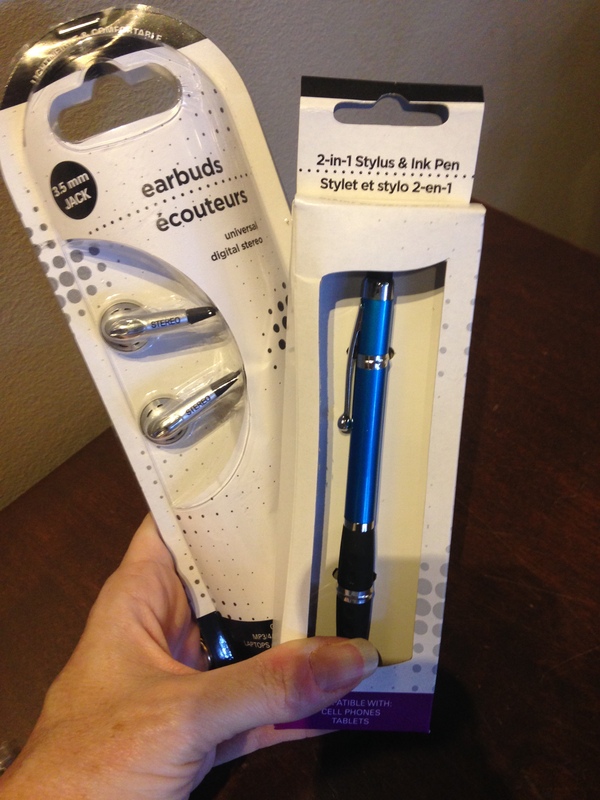 I also picked up a set of snazzy earbuds and a 2-in-1 Stylus/Ink Pen, too. Maybe it’s a geeky thing to do, but you know what? I’m a tech geek at heart. This Twitter milestone reminds me that we are all part of a vital network of people – near and far. Everyone has something of value to share. Whether it’s a resource link on Twitter, a photo of your kids on Facebook, or a really cool recipe idea on Snapguide – sharing your knowledge, sharing your skills, sharing your LIFE, makes a positive impact on others. 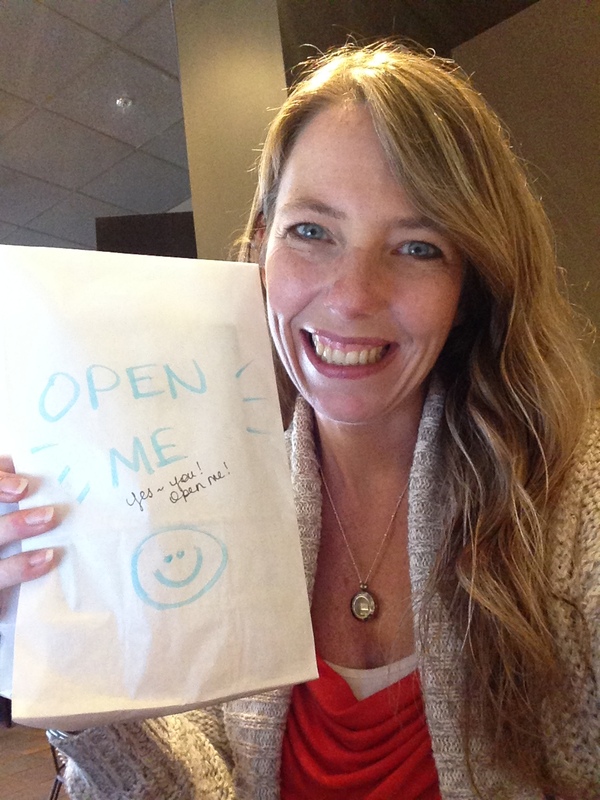 UPDATE: As I had more writing tasks to complete, I decided to stay at Starbucks for a bit to see if anyone would take the bag of goodies I left to be discovered. It’s always an interesting perspective, people watching. I saw two separate people peek inside the bag, then put it back. I saw a teenager nudge his younger sibling to open the bag, only to be disappointed, with no toys or “fun things” inside. I even saw a group of teenagers arrive and animatedly discuss the contents of the bag, which was quite enjoyable to listen to only a few feet away, until they started discussing the value of each item in the bag. I was a bit dismayed when one of the teens took the earbuds, but left the stylus and notebook. My first thought was actual embarrassment, that my surprise gifts had been shunned by adolescents who simply misunderstood the purpose of my RAK. Then my thoughts shifted. It was a free gift, after all. Did she not feel worthy to take the entire bag? Or perhaps she felt guilty taking everything, and wanted someone else to share in the joy of discovery. Maybe she was just a teenager who lost her earbuds and needed new ones. I am a Pollyanna at heart. I watched this gal, her new earbuds grasped in her hands balanced with her specialty Starbucks drink, and I would like to think that her day was blessed by my generosity. After all, new earbuds is a cool find for a teenager.